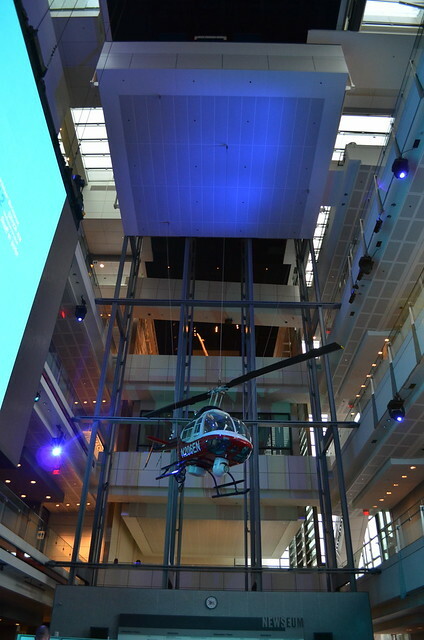 Peter Durand, Creative Director for Alphachimp was on-hand to capture the controversies as the conference speakers debated creative ways to expand the free flow of information online. 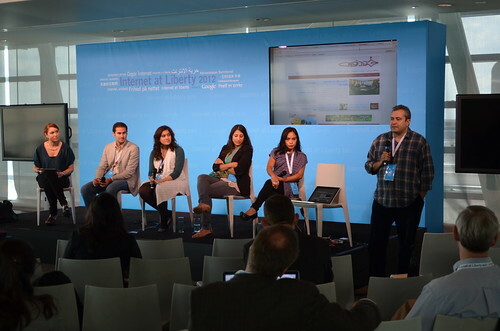 One of the structured debates focused on whether a more centralized system of governance is needed for the Internet. The crux of the debate? Whether standards are a top-down process determined by corporations, governments and funders of the internet as a "necessary utility" or a bottom-up process based on freedom, access, and anonymity. 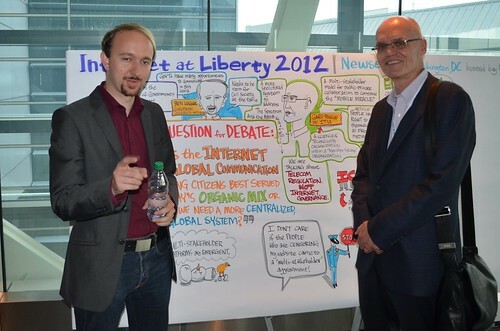 Speaking for venerable 145-year-old International Telecommunications Union office to the United Nations was Gary Fowlie (above right) advocating for worldwide standards that "foster seamless interconnection of a vast range of communications systems and addressed the global challenges of our times, such as mitigating climate change and strengthening cybersecurity". Ben Wagner (above left) of the European University Institute works to coordinate "dynamic forums" to support the United Nations Secretary-General in carrying out the mandate from the World Summit on the Information Society (WSIS) with regard to convening a new forum for multi-stakeholder policy dialogue - the Internet Governance Forum (IGF). There were so many brave internet activists from countries like Pakistan, Thailand, Sri Lanka, the former Soviet states, Indonesia, Malaysia, India and many countries where to speak one's mind is still a dangerous thing! 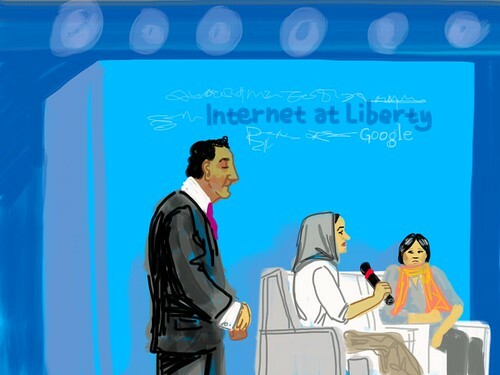 Above is an iPad sketch by Peter Durand depicting Sana Saleem and Jiew Premchaiporn interviewed by Riz Khan, famous television presenter with Al Jazeera English, BBC, and CNN. 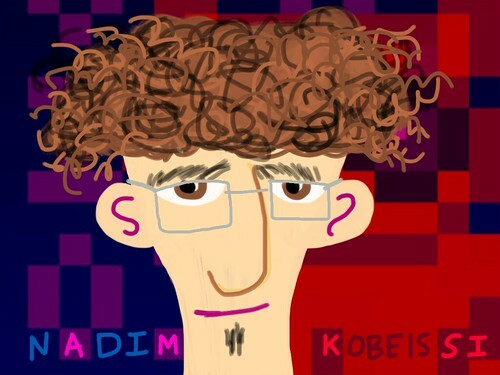 Nadim Kobeissi (below) is a computer wizard with a sense of civil awareness. In his focus on web engineering, cryptography and activism, Nadim has developed Crypto.Cat, an open source web chat client with client-side public key cryptography. As a student in Iran, Nik Kowsar came across the brilliant caricatures of David Levine. Nik (speaking in photo below) started drawing his professors and was approached by the editor of a national satirical magazine. At the height of his career, he was illustrating for all three top newspapers. Then in 2000, one of Kowsar's political cartoons--with a veiled reference to an Iranian leader--triggered a "security crisis" that landed him in jail for a week and led to 3 years of periodic interrogation. Now a Canadian citizen and board member of Cartoonists Rights Network International, Kowsar is monitoring the freedom and repression of cartoonists and journalists globally, with a focus on the Middle East for example this cartoonist in Iran sentenced to 25 lashes! 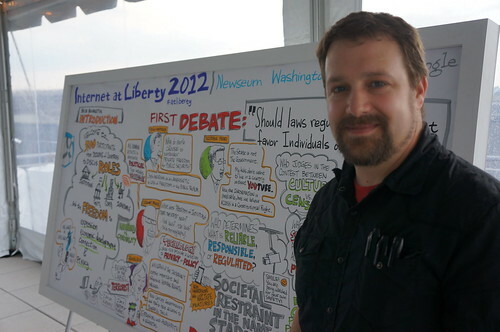 Internet at Liberty 2012 was held at the Newseum — a 250,000-square-foot museum of news — dedicated to educating the public about the value of a free press in a free society. 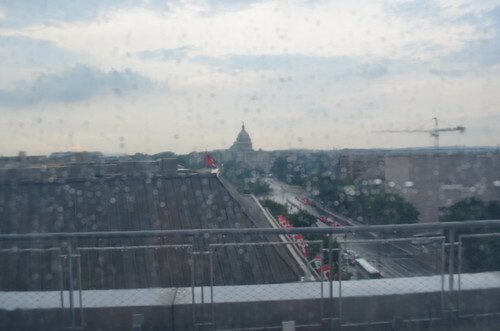 Located on Pennsylvania Ave., we were in view of The US Capitol, where debates on access, security, privacy and internet freedom affect the entire world. We will end with a photo taken from the "Freedom Zone", the fenced in area where protesters must be permitted and contained... a full 200 yards away from the White House. Our country is still debating the limits of free speech and right to assemble!